The holidays can be a stressful time of year for seniors in assisted living care, particularly those whose families don’t live close enough to make an easy visit. If someone doesn’t feel they can fully participate in the festivities—whether due to distance or due to personal limitations—it can be easy to experience feelings of isolation and loneliness. Vista Prairie Communities does a lot throughout the holidays to help seniors feel engaged in the holiday spirit by making it easy to celebrate with families and staff. There are also many things you can do to make your senior’s holiday season special, no matter if you leave near or far. Decorations – Vista Prairie communities all decorate to the nines during the holiday season. Many assisted living residents experience nostalgia for the traditions they once observed in their previous homes. Holiday decorations can help their new living space feel more like home, and decorations do wonders to help people get into the holiday spirit. Activities – Our staff encourage all residents and their families to participate in holiday activities. We welcome special requests for events and take inspiration from local culture and customs to create an atmosphere that feels familiar and festive to our residents. Engaging in activities with other residents, staff, and family members helps to boost holiday spirit and ward off feelings of isolation. Personalization – Some of our residents experience limitations that make it hard for them to participate in group festivities. For these residents, we create individualized opportunities for them to celebrate the holidays in a way that is meaningful and comfortable for them. Personalized activities can include inviting family members to look through old holiday photo albums, or playing a beloved CD of holiday music. If you’re planning to visit a loved one in assisted living this holiday season, think ahead about ways that you can celebrate together. Even if you won’t be able to make an in person visit, there are plenty of ways you can share holiday cheer. Attend holiday events. Not only will they enjoy the quality time together, but attending holiday events at your loved one’s assisted living community will make them feel supported and important to the festivities of the season. Decorate their room. 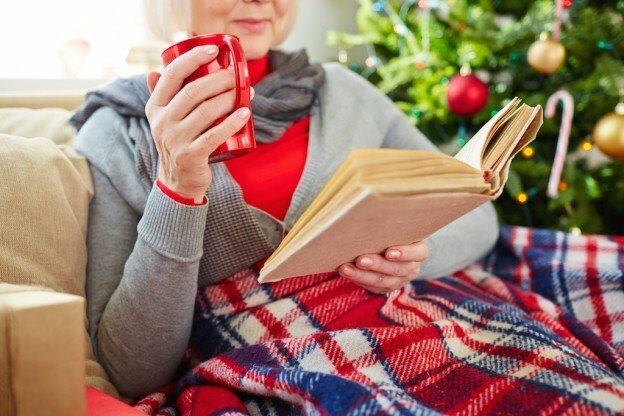 The public spaces in their senior living community are sure to be decked out for the holidays, but setting up some small decorations in their room will help make sure the holiday spirit continues even in their alone time. Try finding a small tree or hanging some tinsel. Bring their favorite treats. Baking your loved one’s favorite holiday treat shows that you’re thinking of them during this holiday season. Besides, nothing spreads holiday cheer like a tasty Christmas cookie! If you’re out of state, bake a batch of cookies and mail them in a care package. Send a holiday card. Handwritten notes mean more to many seniors than a longer typed letter that’s not personalized. Include a photo of your family to make them feel close to you even though they can’t be present. Open gifts together. Whether it’s in person or over Skype, schedule a time for you and your loved one to open gifts together. If you have kids, recruit them to contribute handmade drawings and cards to your loved one’s care package. Likewise, you can offer to help your loved one brainstorm ideas for gifts to give their grandkids. Watching their grandchildren squeal with glee as they open their gifts is sure to bring a smile to their face. Share holiday music. If they don’t have one already, buy your loved one a CD player to set up in their room, along with copies of their favorite Christmas albums. Nothing spreads holiday cheer like hymns, carols, and seasonal sing-alongs. If they feel up to it, you could even recruit a small group of family members and neighbors or friends to go caroling around the hallways! Happy Holidays from all of us at Vista Prairie Communities! This entry was posted in For the Family, Life at VPC on December 1, 2018 by Molly Geipel.